This season the Fall/Winter 18 Prét-á-porter line embraces the idea of enjoying the chilliest moment of the year, dressing a woman of timeless taste who values, above all, quality without neglecting design or the latest trends. Special thanks to Karen Azzinnari for the trust and love. This season the Prét-á-Porter line showcases its summery spirit, with an eagerness to dress a woman of timeless taste, who values, above all else, quality with a penchant for design and the latest trends. 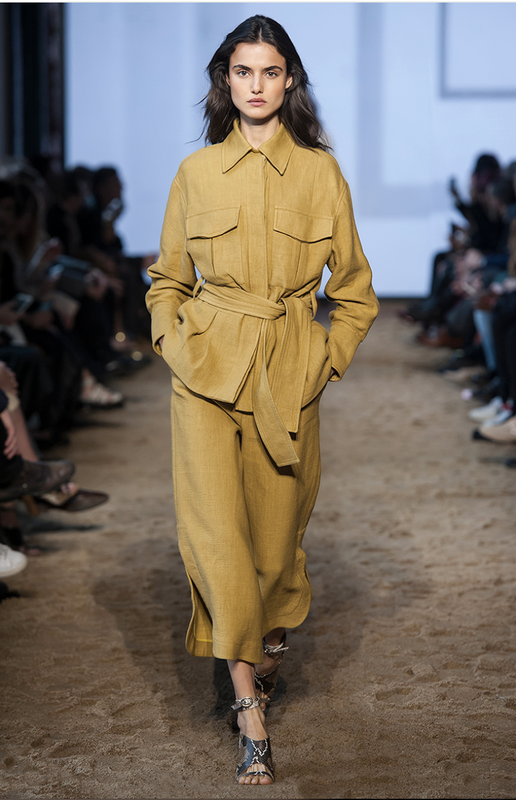 Khaki and beige colour palettes reign Pret-a-Porter once again, with infallible white and navy blue, which collection after collection has consolidated as the chromatic range of the firm. Subtle sky blue adds a breath of fresh air and refinement to the colour palette sharing the prominence with pinks, reds and a range of greens, creating an explosion of colour fundamental to summer fashion. Capri pants, trenches, tops and cotton flared dresses with lace and ruffles are just some of the essential pieces combined with sandals, bluchers, sneakers and mules bringing an impeccable touch of style to women showcasing the new Prêt- à-porter collection. Vichi top and paper bag pants by Tot-Hom. The collection focuses on oversized garments mixed with summer dresses in cheerful elegant styles, making this collection the perfect ally for our wardrobes this summer. Beautiful prints are the key to the most ready-to-wear line of the brand. Floral prints, stripes, and gingham in a wide range of colours. waterproof jacket, tailored pants and cotton white tee by Tot-Hom. Backstage at Cedar Lake, an event space in Chelsea, a crowd was bustling around with purpose. Models, dressers, hair and makeup stylists, photographers and publicists were prepping for Zadig & Voltaire’s runway show for Fall 2018, which was to start in a little less than an hour. But unlike most presentations at New York Fashion Week, an occasion that usually encapsulates bedlam, this one appeared a little less harried. This year, Zadig & Voltaire is celebrating its 20th anniversary, a benchmark that is seldom achieved, especially in luxury. With the state of fashion in flux now that spending habits have shifted toward Instagram-worthy experiences, many are left scrambling to find their footing in markets across the globe. The brand has stayed above the fray, relatively speaking, because it doesn’t deviate from its original message. Even when the trend of the moment is something radically different from it’s core aesthetic, it stays true to itself—something that the Zadig & Voltaire’s founder, Thierry Gillier, 58, learned early on. 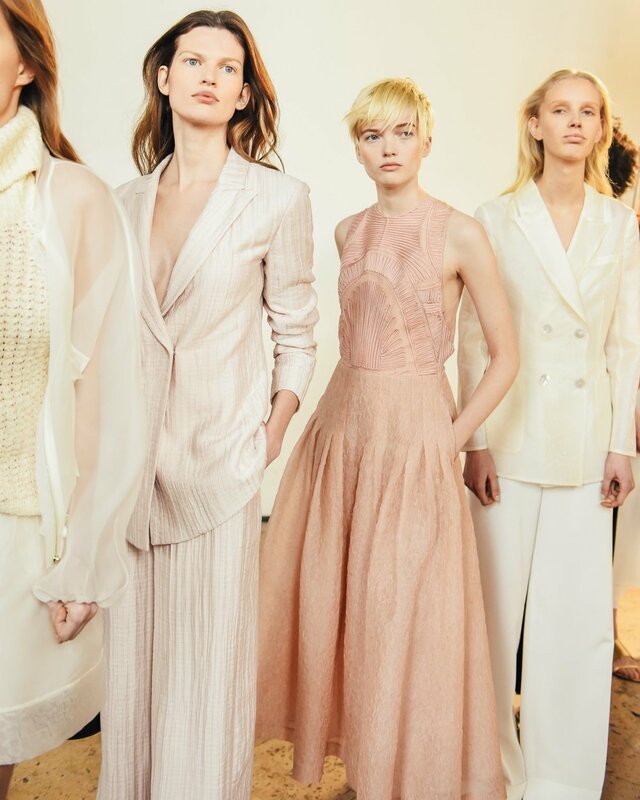 The majestic Palais de Tokyo in Paris was the stage chosen by Massimo Dutti to present, in a very special parade, Limited Edition SS18, its most exclusive collection of the season. Under the concept "See-now, Buy-now" -the system that is committed the world of fashion to put on sale their collections shortly after showing them-, the firm made a statement of intent for the next season spring / summer, with an inspiring fashion show that sets trends. The history of haute couture is intimately linked with the history of modern art. The couturier is an artist unto himself and the word “atelier” designates equally the studio of an artist or that of a designer. But any artist’s true “studio” is his or her spirit. It’s in this dimension, located somewhere between dream and reality, or imagination and realization, that Maria Grazia Chiuri, the Artistic Director of the House’s women’s collections, pursues her research and explorations. Because haute couture is a dream of fashion. It’s a place where there are no limits to pushing boundaries and experimenting with technique, material and form. Immersing herself in the heart of the Surrealist movement made it possible to bring a fresh breath of imagination to the spring-summer 2018 haute couture collection, conjuring an otherworldliness and constant optical illusion. 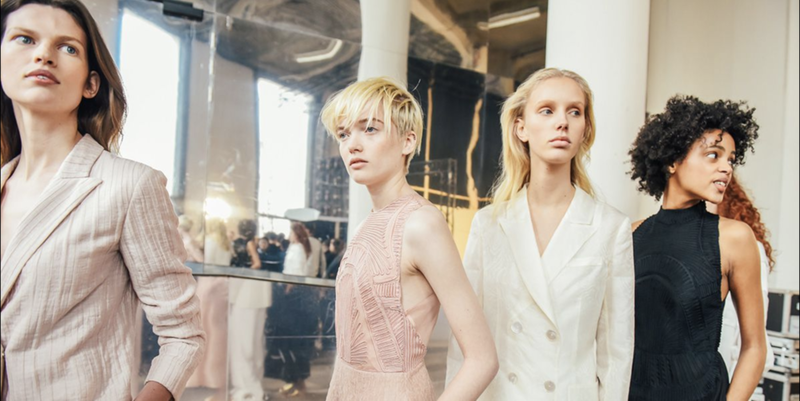 Surrealism also applies to the evocative words and phrases that guided Maria Grazia Chiuri in creating a collection predominantly in black in white sprinkled with illusion and surprise. Never trust a first impression… In that spirit, generous pleats on a white evening dress are etched in black like the pages of a book, while caging, a recurring motif in Surrealist works, is transformed into a black mesh fabric that hugs the body and underscores transparency as silvery fishnet mingles with the density of velvet. But above all, it’s the charisma of the artist Leonor Fini that defines this collection’s strict yet radical attitude. Leonor Fini, who left Italy for Paris in the Thirties, held her first exhibition in Christian Dior’s gallery and befriended the designer from that moment onward. Whenever she made one of her phantasmagorical appearances, she often wore Dior. Leonor Fini was the incarnation of the then-revolutionary idea that one must always remain independent and reinvent oneself as a representation of all possible realities. She used clothing to define herself and set her own stage, in public as in private: at once influential, severe and elegant, she struck poses inspired by portraits of men from the Renaissance, by the constant interaction of art and life, and the blend of the natural and artificial. These marvels of haute couture came into being in a dimension suspended between dream and reality. The same applies to the daywear for which Christian Dior had such a knack, and notably to shapes reinterpreted using traditional men’s wear fabrics. Maria Grazia Chiuri draws on these as inspiration in a series of suits that recalibrates Dior’s curves to today’s tastes, paired with skirts of multiple contrasts. Ever faithful to the Surrealist tradition of deconstructed forms, accessories make their presence felt in a whimsical way: a fishnet stocking veils a sandal, while gloves clutch an ankle. It’s this way of seeing and being seen, with a point of view that draws on the unconscious and today’s world, that Maria Grazia Chiuri uses as a foil for embroideries and other embellishments. On a dress illuminated by a mirage of peacock feathers, precious and delicate ornaments become eyes that behold and express mystery — as well as the spiritual power of today’s women. Special thanks to Karen Azzinnari and Gary Pinagot for the amazing experience. The Line A Fall/Winter 2017-18 collection surprises with a great chromatic explosion – reds, blues and yellows merge with an eternal graphite grey, enveloped in camel and elegant navy blue – giving life to a collection synonymous with refined minimalism. Jumpers and dresses with feathers, maxi coats, fur vests and oversized pants unite to form part of the most desired looks of the season. A collection that highlights cosmopolitan essence and elevates it to the limit of urban femininity. Cashmere hooded top, knitted fur vest & tailored pants by Tot-Hom. And handmade in Spain under the design of three generations of experience under the name of Marta Rota and her daughters Andrea and Alejandra Osés. Godet sleeveles dress & Cashmere feathered cardigan by Tot-Hom. There is so much magic during this time of the year. Christmas means family, unity and love. The perfect excuse to spend time together and surprise those who are loved. Learn about Alex's latest campaign with the Spanish jewelry maison RABAT and discover her selected pieces for the perfect Christmas gift. O'Sur has been created to last over time, making sure this journey with you, year after year, is based on a timeless design, ensuring maximum care and quality of leathers and tissues. All O'Sur products are handmade in Spain with first quality materials. O'Sur is the result of the expression of the Mediterranean lifestyle and values: the elegance of free spirit, of being alive and mixed, with the joy of a culture full of light, history and diversity. Tot-Hom is elegance and distinction. The brand success is consequence of the passion and hard work of the founder, Marta Rota and her experimented team who work with the same entusiasm as the first day. The integration of her daughters, Andrea and Alejandra Osés Rota introduced new lines to the brand and opened the doors to the International market. Tot-Hom Ready to Wear is about easy to wear and versatil clothes that never go out of fashion. Clothes are made with the best materials and perfect patterns. Details as flower broches and ruffles are a romantic constant in Tot-Hom Ready to wear collections. Wearing Tot-Hom total look: 100% Cashmere cardigan & feather trimmed pencil skirt. For its debut the brand presents “TIMELESS”. The Collection is a hymn to pure excellence and sophistication, an homage to the noblest fabric, silk, exclusively supplied by the world’s leading manufacturers of Italian silk, and to the finest cotton, produced by a leader in the manufacturing of Italian shirting textiles. With one foot in the tradition and the other one in the future, the brand showcases a collection which is the quintessence of elegance: an effortless chic, sober, and flawless style, with impeccable silhouettes featuring a game of light and shadows, where the concept of “contrasts” is the leitmotif, subtly balancing the texture and refracting glow of the fabrics, while adding a touch of contemporariness to a timeless aesthetic. Inspired by spectacular views of the Australian sky and ocean, by dramatic hues of blue, by dazzling stretches of white sand, by a sense of freedom and a strong bond with nature that are the distinctive traits of a country glowing under the Southern Cross constellation, OUT OF THE BLUE captures the essence of the Australian soul through the eyes and sensitivity of an Italian-born designer who passionately advocates the purest Made in Italy as the most authentic expression of quality and excellence. Alex Rivière no es fan de las etiquetas. Prefiere definirse como «una apasionada de la moda que estudió un año de Diseño antes de compaginar la carrera de Marketing y Comunicación con Administración y Dirección de Empresas, por obligación parental (risas)». Pero sus 117.000 seguidores ven más allá de su papel como directora creativa del despacho que lleva su nombre. Su perfil en redes sociales, cuidado y minimalista, sigue su definición de estilo: «Me encanta la belleza clásica; las costuras perfectas y los patrones bien hechos. Tener un buen fondo de armario es esencial». ¿El complemento final de cualquier look? «Sin duda, la fragancia», confiesa. La unión de ambas pasiones la convierte en la heredera idónea del legado de Christian Dior. Él, que se sentía «tan costurero como perfumista», tenía como fuente de inspiración la campiña de la conocida como capital de las flores: Grasse, en la Provenza. Hasta allí viajamos con Alex para vivir uno de los momentos favoritos del histórico creador: la recolección. Recorrer estos campos tan ricos es un paseo por los orígenes de la firma. Las fórmulas inéditas que el nariz François Demachy crea en su laboratorio de Les Fontaines Parfumées se asemejan a los reconocibles cortes del maestro, mientras que las delicadas puntadas de sus piezas encuentran su sinónimo en la recogida de la selecta materia prima de este territorio. Y si la chaqueta Bar es la prenda fetiche de la maison, el jazmín es el punto débil del perfumista. El escenario de esta visita, Le Domaine de Manon, da fe de ello. 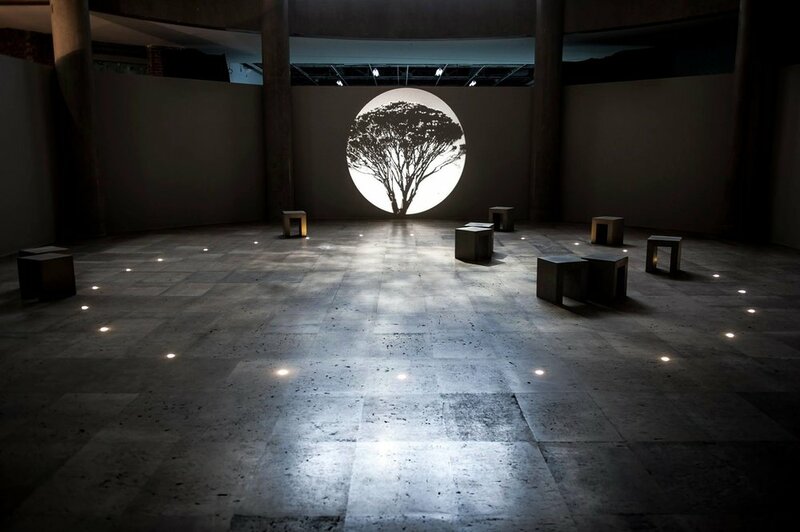 Fue la primera explotación proveedora en exclusiva de Dior, gracias a que la visión de su directora, Carole Bian- calana, le conquistó con la unión del savoir-faire ancestral y el cultivo bio en sus dos joyas: la variedad grandiflorum de esta flor blanca y la rosa centifolia. El primero, que sólo crece en las excelentes condiciones de Grasse, «tiene diferentes facetas. Puede juntar varios aromas, como mango, almendra, plátano, melocotón, leche... e incluso una esencia más animal. Y, en función de las condiciones climáticas, predomina la una o la otra», apunta Carole. Su peculiaridad lo convierte en un frágil tesoro escaso (quedan unos 30 productores) que se recoge únicamente de julio a octubre, ya que la temperatura es esencial para su calidad. En verano, los pétalos se abren de noche y el trabajo comienza a las seis de la mañana para evitar que los casi 40 grados del mediodía las dañen. A finales de septiembre, hay que esperar a las ocho para que el calor abra los mismos ejemplares. Y a primera hora es cuando una tierra recién teñida de blanco recibe a Alex. Los operarios ya están armados con sus cestas y le explican que hay que pinzar cada flor sin prisa pero sin pausa. Una vez que las plantas quedan limpias, se someten a un proceso de extracción para conseguir un concreto. Durante los 120 días que dura la temporada, estos concentra- dos se guardan para mezclarse sólo al final. Su objetivo es unificar las aristas de la especie y dar con un resultado similar año tras año. Alex pregunta cuál es el destino final de esa esencia. «Casi todo es para J’adore L’Or», revela Carole. «Cuando en 2010 descubrí la fragancia, me emocioné. Fue como trasladarme a mis campos». Siete años después, el frasco ha engalanado sus curvas con un proceso de grabado único que lo convierte en un auténtico objeto de deseo. «La saga J’adore está grabada en la memoria colectiva. Son aromas para mujeres independientes, sensuales y seguras de sí mismas», afirma Alex entusiasmada. Para cerrar la jornada, y mientras de- gustan una brioche con mermelada de jazmín, Carole le confiesa su proyecto más ambicioso: su asociaciación, Les Fleurs d’Exception du Pays de Grasse (creada para ayudar a nuevos cultivadores), se ha unido a productores, fabricantes y casas de perfumería para presentar un informe en la Unesco. ¿Su fin? Convertir este saber ancestral en Patrimonio Inmaterial de la Humanidad. «Lo vamos a lograr, pero hasta el año que viene no nos lo confirmarán», añade. Nosotras tenemos el champán enfriándose.